This past weekend I was in Chicago from Friday to Monday to attend a daylong study abroad returnee conference on Saturday: Lessons from Abroad. I'd found out about the conference sometime in December from a study abroad alumni email I get monthly from UW-Madison. They were offering free admission to the first 15 people to reply to the email with a brief answer to their question (Why do you want to attend, or something like that). I thought about hitting reply to win that admission (which was only $15, by the way), just as I'd won an admission scholarship to the 23rd Annual Conference of Office Professional in 2012. But then I started thinking of the hassle of getting to Chicago—how would I get to the bus stop in Madison during the day to catch the bus, where would I stay, is this even going to be worth it, won't it just be a bunch of undergrads who just got back from study abroad? And so I didn't reply to the email. Then I got another email maybe a week or two later advertising the same deal, and for whatever reason, after getting past my initial disbelief that there were actually still free tickets available, I replied and answered their question in the word limit to apply for the free admission. I got a quick response saying they'd already awarded all 15 (just as I'd suspected), but still encouraged me to attend. I must have been in a different mood this time, because I bought a ticket right then and there. Then I booked a 3-night stay at Chicago's Hostelling International Hostel soon after, and bought the bus tickets last, a month or so later. I extended the weekend because I had no reason not to; my work is portable, and why not make a bus ticket more worth it. The Madison Hostel is in an older house-converted-hostel, though, so it's definitely on the smaller scale. 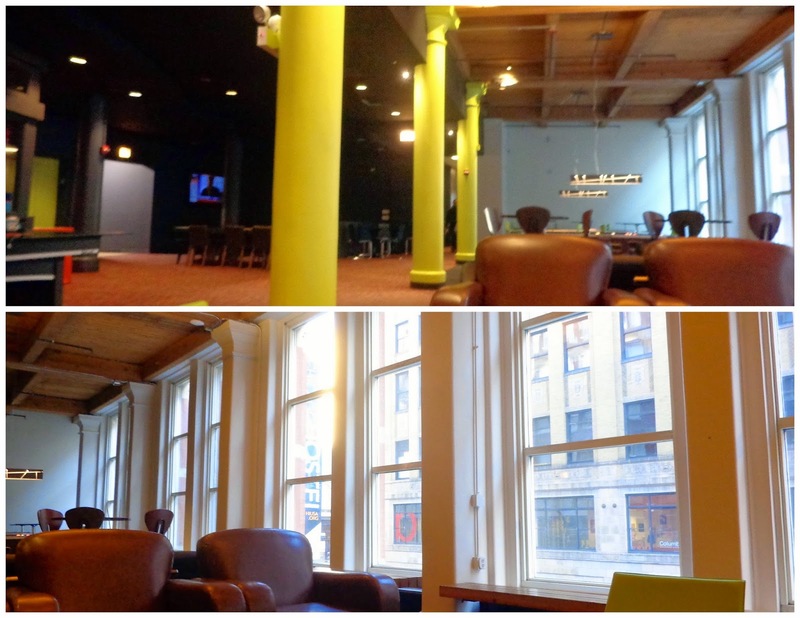 I had never been to Chicago's hostel, and wasn't sure what to expect. You guys, it's gorgeous. Amazing, clean, friendly, knowledgeable, organized, etc. etc. etc. Don't even get me started on the fabulously informative and beautifully designed bulletin boards all around the hostel, or the awesome murals in the stairwells. Security is obviously a bigger issue in Chicago than in Madison, and the HI Chicago Hostel has swipe cards (like hostels) that you use to enter every door, stairway and to use the elevators. I felt super safe and secure inside. One notable feature that sets Hostelling International apart from most other hostels is that you can't bring alcohol in. But, you can drink during hostel-sponsored events, in which they supply the alcohol for free. There were two of these events during my three-night stay. I get checked in and see that they're having a "cultural kitchen" event that night, sign your name to go to a free Italian dinner at 6:30. Say whaa? Hokay, I signed my name. While hanging out in the common room, waiting for the dinner, there was a "welcome party" at 5:30 for an hour with wine and beer (I think there was probably a 2-drink limit per person or something, but it was very casual—nothing crazy, folks). While I was working in the lobby, before the "welcome party" even got started, some high school kids started coming around, asking the few of us scattered in that large room some questions. Many began with "Can I ask you a question?" Sure, try me. They were playing human bingo, so there's a bingo board with characteristics in each square (e.g. Someone who can sing their country's national anthem, someone who wasn't born in the USA, someone who can eat with chopsticks, etc."). It was funny because sometimes friends would come up in pairs, and only one would ask you a question and the other one would stay hidden behind the asker. Then after you answer, they turn and tell it to their "shy" friend who writes it down on their own chart. Ah, youth. I later learned that these were students from the culinary class at Prosser Career Academy—the high schoolers who had cooked dinner for that evening's cultural kitchen. 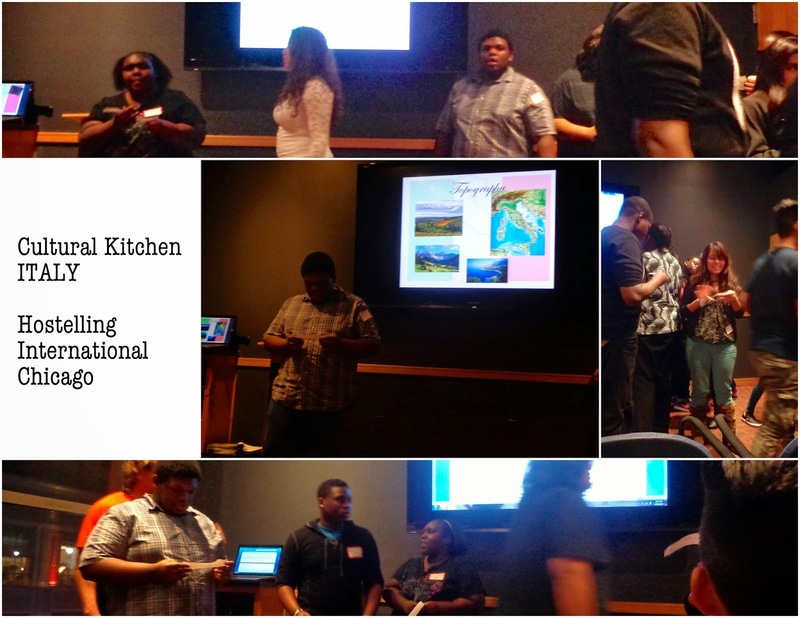 Here's the gist of cultural kitchen. A group of high school students choose a country and study its cuisine and culture over the course of... I'm not sure—a month? To culminate the experience, they come to HI Chicago and stay over for a night. They cook a meal from their selected country and serve it to hostel guests. Afterwards, they do a presentation about their country of choice. There were probably a few more activities the next day, but these were the parts that I was witness to. So when 6:30 rolls near, we head into the dining area. I took a seat at a table of five students, so I got to pick their brains about their school. It was fun to have the time to talk to them face to face. They were teaching me Chicago (teen?) slang—that if something's cool, just throw the word "young" in front of it. Ah there was one more but I don't remember it now. Dinner was delicious, though I'm pretty sure all of the high schoolers saved their appetites for pizza that was ordered for them after the presentation. In the presentation room post-dinner, each kid was handed a slip of paper with what they should read about Italy for their slide. Pretty sure the slips were cut straight from Wikipedia, and that the instructor made the PowerPoint, but that's all right. So it was er - unpracticed and casual. Funny to hear the kids interact though "How do you even say this word? I don't even know how to say this word" (topography). I talked with the HI woman in charge of Chicago's Cultural Kitchen afterwards for a bit, mostly to praise the program and ask more about it. Another woman (involved in the program) was with us, and chimed in that so often people get an idea of what Chicago's youth is like. But then getting to meet some in person through Cultural Kitchen always changes people's opinions. I loved the program because there was a clear two-way benefit. Students learn about hosteling and get to meet international people that they wouldn't otherwise, and the travelers get to connect with Chicago's youth face to face. Not to mention the free dinner. I was so happy with that first night of unexpected wonderful events that I declared the trip down had already been so worth it. That evening I walked around in the cold with a Korean, Argentinian and Polish-American I'd met in the hostel. And then Saturday was the conference. I'll give some general impressions before getting to a play by play. I left at the end of the day feeling "meh," though I think it largely has to do with the fact that I've been abroad and back three separate years now, having graduated in 2011, so it's kind of old news. I know about reverse culture shock, and I know how to keep my study abroad experience "alive," because that's what I've been doing for the past five years. But I knew that most attendees would be current undergrads, and that difference stood out to me a lot while trying to connect with others. I was able to answer a few questions for two girls interested in teaching English in Spain after they graduate, but I didn't walk away with many new ideas from other attendees, since they were still in school. The conference opened in the main room. I'd say we were more than 100, less than 200 in attendance. I had entered the building just behind another girl, and in the elevator discovered we were both going to the conference and she went to UW. We sat by each other in the main room, and when conversation naturally stopped, I glanced around to see who else I could meet. Looking around, I saw people scattered about sitting alone, staying entertained with their phones. I said an Abbi "No, no, no!" in my mind. Although I prefer being alone, being with close friends, or meeting cool open travelers at hostels, we had all paid to be here at this conference (well, except the 15 UW students who won their free registration, but that's besides the point), and should try to meet people and learn something new. So I turned around and made the girl behind me set down her phone by asking her where she had studied abroad. Two others got into the conversation eventually, as the room slowly filled up. The keynote speaker was Ambassador Ian C. Kelly, and boy, what a treat! I didn't even know who he was beforehand, but he was so great at speaking. There was no filter—it was like he was talking to a good friend. In the Q&A at the end, he told us a few Hilary Clinton anecdotes, about his interview with her, and some trips they went on together. It was very cool to get an insider's look, plus to hear his opinion that she has what it takes to run this country. Next was a big-group workshop on strategies for re-entry (aka reverse culture shock), which involved lots of forced discussion in small groups around you. This maybe would have been more helpful right after coming back from Spain the first or second time, but it all felt like old news, and my perspective felt distant compared to the fresh wounds of students around me. In the hall between sessions there were maybe 15-20 booths of various companies and programs like Greenheart Travel, Peace Corps, TEFL schools, etc. If you got signatures from 10 different booths on a card, you'd be entered in a raffle at the end of the day. So afterwards I started making my way around the booths during the ten minute break. Next I went to a panel called "Work, intern teach, volunteer, grad study abroad," which sounded like it would be super useful. (The other option—the concurrent session—was another culture shock workshop, by the way). And then we were at lunch! I sat at a table of three new faces during lunch, and made efforts to socialize and learn about everyone. Then there was an hour of the opportunities fair (those booths in the hall) before the next session, so I got over ten signatures and turned that sucker into the raffle box, folding it in half to stick out (and hopefully get drawn, you know). The next session I went to was titled "Pathway to Entrepreneurship," which I chose over "Personal Branding." I'm just really sick of personal branding and online presence social media schmuck, plus I think freelancing is a step towards entrepreneurship, why not find out more? The man who led this session worked for and talked on behalf of his entrepreneur boss. The talk would have been strengthened immensely had it been her speaking about her own experiences, rather than him retelling parts of her story. Then we broke into small groups and had 10-15 minutes to... come up with a product that somehow involved a pineapple. We had to know who it was for, where you could sell it, and some other detail. Yup, I totally groaned on the inside when he said we were doing that. After the time was up, each group went around and shared their product idea. All different things! Amazing! Would you look at that! Then we were given at least 15 more minutes to each share some problem we encountered during our study abroad experience, and how we could create a product/business to solve the problem. Choose the best product and brainstorm with your group. Yada yada. And that basically took the rest of the session. It can't necessarily be easy to run a killer session, but had I known that the bulk of this one was going to be small group brainstorming from high school days, I probably would have gone to the other session to see what was presented. For this final session it was either this one or "How to Get an International Career." I had been torn between the two, but ended up (unknowingly) sitting by the woman presenting this internationally focused life seminar back at the start of the day. I think she was the oldest presenter at the conference, and told me that after traveling and expating for so long, tons of this kind of stuff is old news to her. So she wanted to offer a fresh perspective—and that's what sold me. It was an excellent session—the best session of the day (behind the keynote, if you put that in the "sessions" category). Lots of motivational and encouraging talk about global citizenship and pursuing your passions. Doing what makes you happy while simultaneously fulfilling a need in the world. The kind of stuff I've been centering my life around. And the presenter, Dr. Zinta Konrad had the perfect tone; she was confident and self-assured, yet talked with us as if we were having a conversation. Then we had 55 more minutes of the opportunities fair in the hall. I was starting to get tired at this point from expending so much energy trying to be outgoing that day, and couldn't fathom why we had nearly an hour more of this fair after I'd already turned in my signatures sheet and talked with every booth there. Turns out they were doing resume critiquing in the big room during this time. I'd read that this would be available, but hadn't seen anywhere to sign up earlier in the day. Apparently there was somewhere at the registration desk, but nobody directed me to it or told me where it was when I registered in the morning. So I thought as long as I had brought along copies of my resume (like we were instructed), why not try to get on the list? I talked to the woman, she put my name on the waiting list and I took a seat in the big room, waiting for my turn. I watched the three resume critiquers I could see, and watched their pens write all over the resumes as they read line by line and talked animatedly to the student in front of them. Cool. And then I was up. And it was a huge disappointment. The woman I got told me that she liked my format, how I only had picked the three most recent/relevant job experiences to include, instead of cramming a ton on there. Hokay. And she mentioned I could move qualifications to the bottom, or even remove it entirely. All right. Aaand? She didn't even read a single bullet! That's where I wanted feedback—on the actual content. So I asked: I know hard numbers are good to include in bullet points, could you let me know if the types of points I've included are what I should? I swear I saw a deer-meets-headlights look in her eyes, as she pulled it close and started to quickly read the first bullet. And then we were cut off, because it was time for the next session to start so we had to be done. The last "session" wasn't really a session, but they announced the winner of the photo contest—which I'd totally forgotten to enter, but none of my photos would have beat out the winner. And then they picked the raffle winners, by holding the signature cards flat and spread out, like a giant deck of cards. I didn't see a bent one in the stack. I seriously doubted if mine had made it into the stack. Did they not like the fact that I bent mine? We'll never know. There was a "networking reception" in the hall afterwards, which was just people chit chatting with their friends as people got their coats on and headed out (lots of students came with friends from their universities—I heard "You came alone??" a few times that day). I was totally wiped and just wanted to retreat and be by myself after all of that. So I did! I went and got myself some oriental carry out, brought it back to the hostel, and ate up in the small common room attached to my room, not the big lobby on the second floor. Then I watched some "Gilmore Girls" to relax. 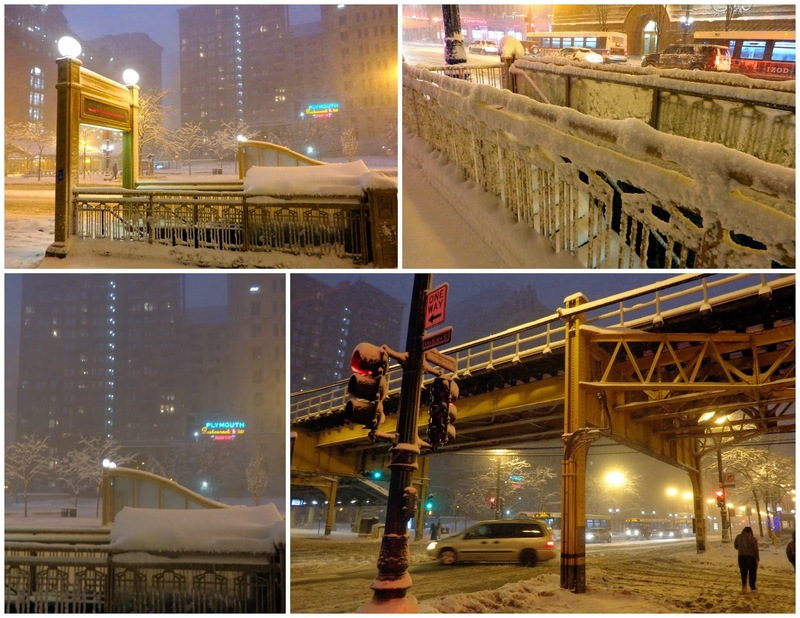 I had heard some conference attendees near the end of the day mention a huge snowfall that was supposed to hit Chicago that night. I had been totally oblivious to this fact, had I not overheard these people at the conference. And boy did the snow ever fall on Sunday. I spent most of the day in a nice "study room" up on my floor, getting work done. A few hours later I peeked out the window to see the windy, frigid winter storm taking place. I watched two cars try to get out of a lot, sharing a shovel between the two. 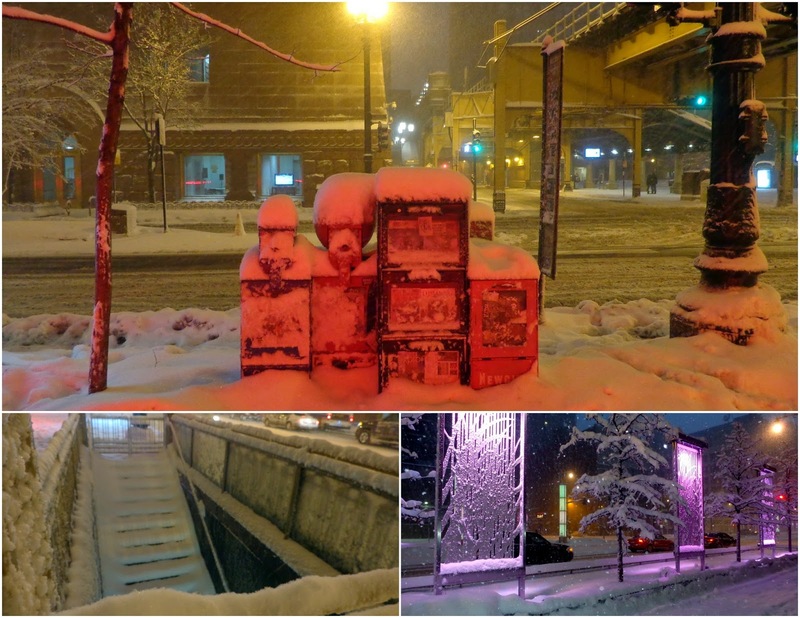 So later in the evening when I had finished my work, I decided to go outside and "walk around" just to see what it was like out there. There weren't many others outside, and it wasn't as simple as merely "walking." The wind was constantly blowing snow in your face, and snow removal obviously couldn't keep up with the loads being dropped by the sky, so my boots were super useful when I had to make my way through feet of snow and lobs of slush. I think the weather reports the next day said that Chicago had gotten something like 17 inches of snow during that snowfall. I found refuge at a nearby Panera for a subpar soup as I read, and then headed back to the hostel. While going in, I saw a sign that there would be beer and chips (the second "alcohol event" that weekend) during the Super Bowl that night. You guys, I'd had no idea that the Super Bowl was that weekend, let alone that evening. Totally off my radar. It had started an hour ago, so I stopped by to see what the crowd was like, but didn't stay because... football. So I went back up to my room and watched some "Gilmore Girls" and finally started season two of "Orange is the New Black." 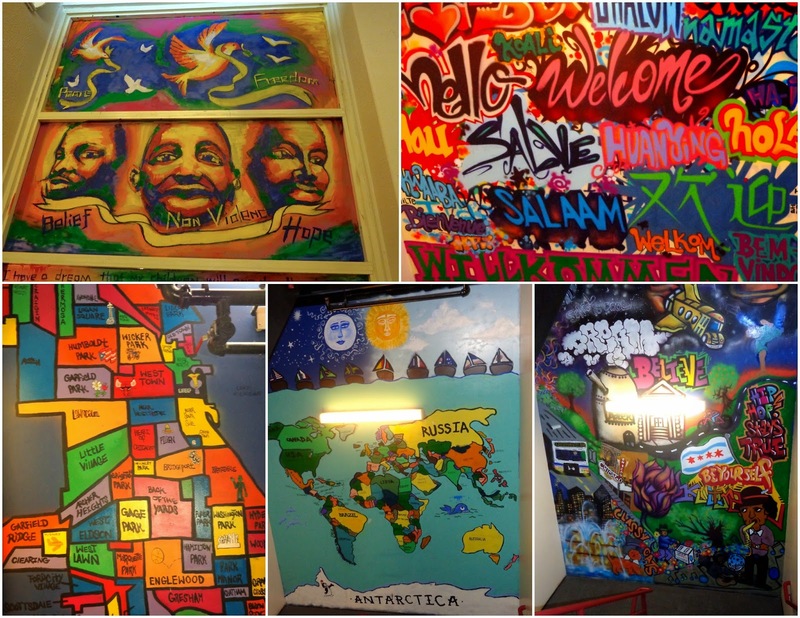 The most satisfying part of the weekend was probably getting acquainted with Hostelling International's Chicago Hostel and the Cultural Kitchen, to be honest. It was also nice to simply remind myself how doable it is to give myself new surroundings, even if just for a long weekend. How are you only just starting OITNB S2?! I knew I'd breeze through it, and was too busy in Korea with my editing and teaching (plus last spring I was slowly making my way through all 7 seasons of Gilmore Girls, which I just finished a few weeks ago). Also, I wanted to have something to look forward to, so ideally I'd watch it once season 3 was out. But, I just finished season 2 yesterday while sick in bed, so there goes that. So good!